NASA's new boss is already getting cheers from space. Immediately after being sworn into office Monday by Vice President Mike Pence, NASA Administrator Jim Bridenstine took a call from the three U.S. astronauts at the International Space Station who offered "hearty congratulations." The Oklahoma congressman became the 13th administrator of NASA, filling a position that had been vacant for more than a year. "America loves what you guys are doing," Bridenstine, a former naval aviator, told the astronauts. He promised to do his best "as we reach for new heights and reveal the unknown for the benefit of humankind." This is the 60th anniversary year for NASA . Bridenstine is the first elected official to lead NASA, something that had bogged down his nomination last year by President Donald Trump. The Senate approved his nomination last week by a narrow vote of 50-49. Monday's swearing-in ceremony took place at NASA headquarters in Washington. 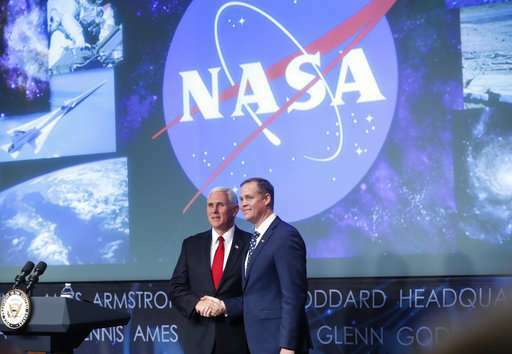 Pence noted that the space agency, under Bridenstine's direction, will work to get astronauts back to the moon and then, with help from commercial space and international partners, on to Mars. "NASA will lead the way," said Pence, who heads the newly resurrected National Space Council. Charles Bolden Jr., a former space shuttle commander and major general in the Marines, was NASA's last official administrator. The space agency was led by Acting Administrator Robert Lightfoot in the interim. Lightfoot retires from NASA at the end of this month.